For other uses, see Gafsa (disambiguation). "Capsa" redirects here. For other uses, see Capsa (disambiguation). Gafsa is the capital of the southwest of Tunisia and is both a historical oasis and home to the mining industry of Tunisia. The city had 111,170 inhabitants at the 2014 census, under the ruling of the mayor, Malek Necibi. The city lies 369 km (229 mi) by road southwest of Tunis. Its geographical coordinates are 34°25′N 8°47′E﻿ / ﻿34.417°N 8.783°E﻿ / 34.417; 8.783. 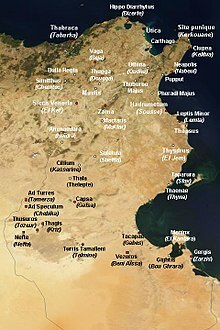 Capsa in Roman times was near the "limes romanus" called Fossatum Africae. Romans ruins at Gafsa, 2013. Excavations at prehistoric sites in the Gafsa area have yielded artefacts and skeletal remains associated with the Capsian culture. This Mesolithic civilisation has been radiocarbon dated to between 10,000 and 6,000 BCE. The associated ancient population, known as the Snail eaters, are known for their extensive middens of snail shells. They are believed to be the ancestors of the modern Berbers. The Vandals conquered the Roman city and ruled it until the death of Genseric (477). The Berbers then occupied it, making it the capital of a Romano-Berber kingdom until subjected to Byzantium under Justinian I (527–565). He made Capsa the capital of the province of Byzacena. The Duke of Byzacena resided there. In 540, the Byzantine governor general Solomon built a new city wall, naming the city Justiniana Capsa. The Arab army of Oqba Ibn Nafi conquered Gafsa in 688, in spite of resistance from the Berbers. After the Arab conquest, Capsa started to lose importance, replaced by Muslim-founded Kairouan. Historians such as Camps and Laverde consider Gafsa the place in North Africa where African Romance last survived, until the 13th century, as a spoken language. Extant documents give the names of a few of the bishops of Capsa. In the 3rd century, Donatulus took part in the council that Saint Cyprian convoked in Carthage in 256 to discuss the problem of the lapsi. In the 4th century, at the Council of Carthage (349), Fortunatianus of Capsa was present, mentioned as the first among the bishops of Byzacena. A Donatist bishop of Capsa called Quintasius was at the council held at Cabarsussi in 393 by a breakaway group of Donatists led by Maximianus. In the 5th century, at the joint Council of Carthage (411) attended by Catholics and Donatists, Gams and Morcelli say Capsa was represented by the Donatist Donatianus, and that it had no Catholic bishop. According to the more recent Mesnage, Donatianus was instead the Donatist bishop of Capsus in Numidia, and Capsa in Byzacena was represented by the Catholic Fortunatus and the Donatist Celer, whom the earlier sources attributed to Capsus. All three sources agree in attributing to Capsa the Vindemialis who was one of the Catholic bishops whom Huneric summoned to Carthage in 484 and then exiled. However, the latest editions of the Roman Martyrology, which commemorates Vindemialis on 2 May, call him bishop of Capsus in Numidia. No longer a residential bishopric, Capsa is today listed by the Catholic Church as a titular see. Phosphate mines were discovered as early as 1886, and Gafsa today is home to one of the largest mines of phosphate in the world. In the Second World War, Gafsa suffered heavy bombardment from both the German and Italian side and the Allies. Part of its Kasbah was destroyed. On 27 January 1980, a group of dissidents armed and trained by Libya occupied the city to contest the régime of Habib Bourguiba. 48 people were killed in the battles. 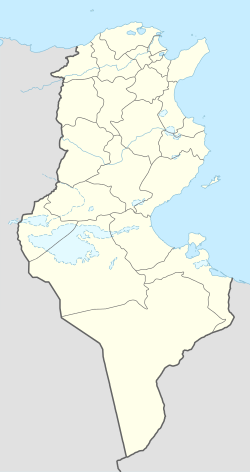 The Gafsa region has had an active political voice throughout its history, and various events there have shaped its political developments in the various phases of modern Tunisia. In 2008, Gafsa was the center of riots directed against the government of President Zine El Abidine Ben Ali. The government was swift and brutal in its suppression of the uprising, but this movement has since been credited with sowing the first seeds of the Jasmine Revolution that removed Zine El Abidine Ben Ali from power three years later, igniting the Arab Spring across much of North Africa and the Middle East. In 2014, a lake suddenly appeared around 25 kilometers from the town. The cause of the lake's formation is currently unknown. Gafsa – Ksar International Airport is located in the city. El Kawafel Sportives de Gafsa (Arabic: القوافل الرياضية بقفصة, often referred to as EGSG) is the main football club of Gafsa. and other government and private Tunisian radios broadcast in Gafsa as Shems FM, RTCI, Youth Radio, Culture Radio, Zitouna, and the National Radio. Gafsa has a hot desert climate (Köppen climate classification BWh). ^ "Recensement de 2004 (Institut National de la Statistique – Tunisie)". ins.nat.tn. Archived from the original on 2015-09-24. Retrieved 2016-03-27. ^ Paul Lachlan MacKendrick, The North African Stones Speak (UNC Press Books, 1 Dec. 2000). ^ a b Trudy Ring, Robert M. Salkin, Sharon La Boda International Dictionary of Historic Places: Middle East and Africa, Volume 4 (Taylor & Francis, 1994) p312. ^ "The Last Christians Of North-West Africa: Some Lessons For Orthodox Today". orthodoxengland.org.uk. Retrieved 2016-03-27. ^ "Gafsa Beach: Mysterious Lake Discovered in Drought-Stricken Tunisia Could be 'Radioactive'". uk.news.yahoo.com. Retrieved 2016-03-27. ^ Vacca, Maria Luisa. "Comune di Napoli -Gemellaggi" [Naples – Twin Towns]. Comune di Napoli (in Italian). Archived from the original on 2013-07-22. Retrieved 2013-08-08. ^ "Gafsa Climate Normals 1961–1990". National Oceanic and Atmospheric Administration. Retrieved 2015-01-24. Wikimedia Commons has media related to Gafsa.